In America, the years after the attacks of September 11, 2001, were marked by fear and suspicion, emotions easily intensified by prejudice and ignorance. 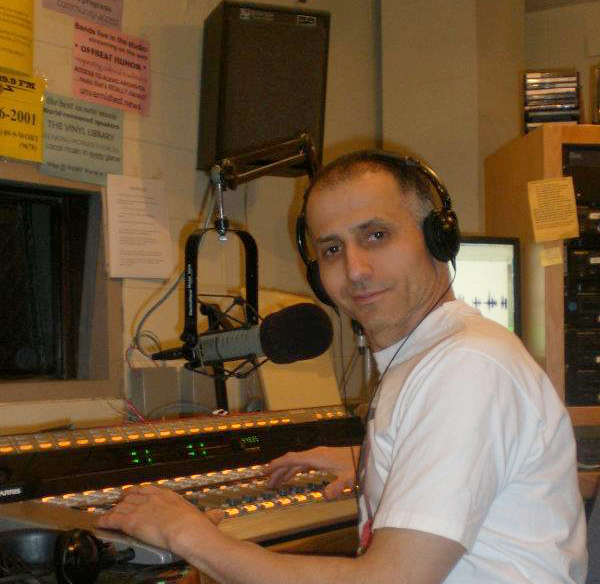 In Madison, Wisconsin, Sabi Attiyeh—a Palestinian-American who, in 1980, at 17, had immigrated to the United States—created a weekly radio show focused on news and culture of the Arab world. Sabi hosts the show through community radio station,WORT, a Pacifica Network affiliate. The About section on the program’s Facebook page reads simply: About Time. Taking on Arabic Misinformation in Mainstream Media. On September 8, 2018, I spoke with host Sabi Attiyeh about his program and his life. “Salamat” took shape over a number of years. Could you talk about how the idea started and grew? Shortly after 9/11, I noticed that there was more scrutiny of Arab-Americans, especially of Muslim Americans. One question burning in America’s mind was—“Why do Muslims hate us so much?” George Bush said they hate our freedom. I was not impressed by the question or the simple-minded answer, but I did not have an answer. That’s the funny thing. I’m not a politician. I don’t think of myself as an ambassador to take the microphone and defend the Palestinian or the Arab or the Muslim population in the United States. But I wanted to demystify my roots, my background. I proposed to the radio station (WORT) that it dedicate more of a program called Third World View to the Middle East, especially in a time when Arabs or Muslims were the flavor of the decade for scapegoating, grouped in one lump sum in the enemy camp. I had made donations to the station and become involved as a volunteer, playing music on a show called Pan-Africa. Then, when I proposed my show, I thought I did not want to do news and analysis. I wanted to do food and culture, poetry, to talk about language differences, and create an opportunity for Americans to learn more about the Middle East in general and more about the Arab-American experience in the Midwest. The program as it exists now follows a general format—news, music, a recipe—all loosely founded in the show’s regular weekly opening, the words “In Arabic we say…” followed by a piece of folk wisdom—for example, “He who does not drink from the well of experience dies thirsty in the ocean of ignorance.”—first in Arabic and then English. The show itself is not very structured. We take issues from the world, from the Middle East in general, and particularly from the Arab-American population. I report on issues where Arab-Americans are gaining more political control of their own populations, especially in areas of densely populated Arab-Americans in Michigan. I’m pleased to see that we, as Arab-Americans, are taking county seats, common council seats, school district seats, Congressional seats, whatever it takes because we need to be represented as we become part of the American mosaic. If we don’t get involved in those policies, in the political landscape, we’ll just be a minority whining about not being treated equally in a place that is controlled by those who have money and power. I was particularly struck by your conversation with a Palestinian-American university student who pointed out how, when some students walked by a campus information table sponsored by Students for Justice in Palestine, he realized that the luxury of disinterest is the very definition of privilege. Ironically, the population that insists on being disinterested—because they’re busy making a living or busy going to school so they can get a job and live the American dream—will face a rude awakening. The typical student graduating from college today is the first generation that has less likelihood of becoming as successful as its predecessor. The opportunities are just not there. America’s economy is built on the war machine; most people don’t realize that. And that war machine feeds conflicts in the world so they can generate income for their wealthy friends. Governor Scott Walker believes the University should crank out corporate workers for profit-making machines. At some point, the discussion always moves on to international events, the Hajj, Israeli control of Palestinian mail—including deliveries of medicine and medical equipment, conditions in Gaza for children, Syrian currency, Saudi investment in the United States, the Senate resolution to end US involvement in Yemen. The goal for the show was a bridge. I’m not representing a community. My opinions are often mine and I make that clear. Since its inception, I’ve had several members of the Arab-American community contribute to the show. Some were afraid to talk about sensitive subjects because they want to go back home some day. I had a co-host from Egypt, and I criticized Hosni Mubarak before he was ousted. My co-host did not want to do any more shows. He said, if he went back home and anyone heard about the show, they would tell the secret service in Egypt and he would possibly disappear. And that fear is very, very real. Journalism in the Middle East is tightly controlled by the government. If some revolutionary started talking negatively about them, they’d be waiting for him. This entry was posted in Affiliate News, News by Diane Reinhardt. Bookmark the permalink.